Set in a grove of palm trees, the Masjid Jamek (Friday Mosque) is Kuala Lumpur‘s most delightful mosque. Built in 1907, the mosque is a tranquil creation of onion domes and minarets of layered pink and cream bricks. 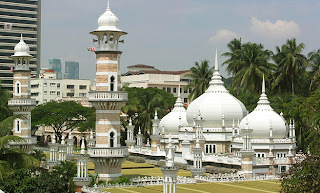 Designed by the British architect AB Hubbock, who sought inspiration from Moghul mosques in India, it can be found at the confluence of the Klang and Gombak rivers – where Kuala Lumpur’s founders first set foot and where supplies for the tin mines were shipped.